Malton are a secondary school based situated within the heart of Yorkshire in a small town called Malton. 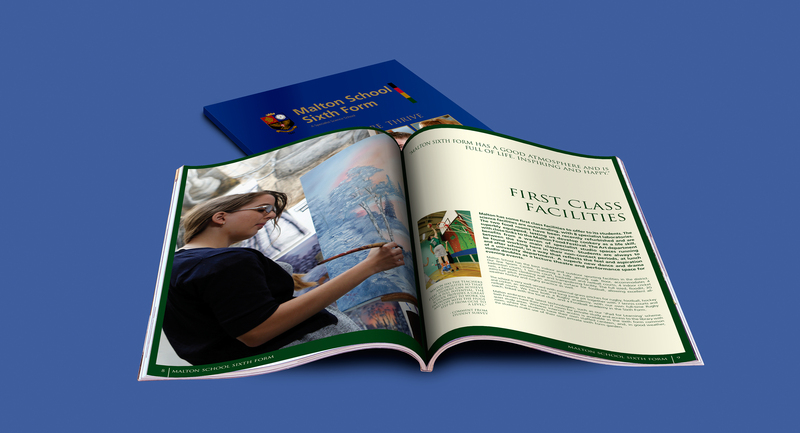 After impressing the headteacher on a number of various projects in previous schools including Malton School, The Creative Agency were commissioned again to come up with a range of marketing literature for Malton Sixth Form. All the marketing material has a grammar school design style which maintains the traditional values of the school. The use of large imagery displays the rural environment and also the allows the capability for dramatic and creative science shots. To promote this new theme, The Creative Agency recently organised a Royal Mail Door Drop to the surrounding areas to promote the upcoming Open Evenings for Main School and Sixth Form (both of which had record parent attendance! ).